In general, diabetic complications are not necessarily a barrier to driving, as long as one’s ability to drive is not impaired. 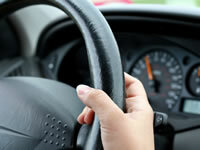 However, there are several diabetes complications that can affect your suitability to drive. The basic sight requirement for driving is to be able to read a vehicle registration plate from a distance of 20 metres. People should also have a minimum field of vision of at least 120 degrees. Conditions including diabetic retinopathy, cataracts, the loss of vision in one eye (monocular vision), glaucoma need not necessarily prevent you from driving where the basic sight requirement can still be met. If you have received laser eye surgery to treat diabetic retinopathy in both eyes (or one eye if you have monocular vision), you will need to inform the DVLA of this. The requirements are set tighter for the driving of heavy goods vehicles (HGVs) and passenger carrying vehicles (PCVs). If you have lost your awareness of hypos, you should not drive. If you are taking insulin as a result of gestational diabetes, the DVLA states that you needn’t inform them unless you take insulin for a period of over 3 months, or if you suffer from disabling hypoglycaemia whilst taking it. Cardiovascular problems tend to only be a problem if the symptoms themselves are present. If you have doubts about whether a heart condition may affect your suitability to drive, contact the DVLA. If you have problem with nerve damage affecting your feet and legs (peripheral neuropathy) that affects your driving competency, you should inform the DVLA. Diabetic nephropathy needn’t be a problem as long as symptoms do not affect your driving. If you suffer from sleep apnea which causes you to feel excessively sleepy during waking hours, you should cease driving until the symptoms clear.